Think Tank roller with pouches for use once on location. Photography is a pain – pain in the shoulder and back that is. When I started in this profession I carried my gear in an over-the-shoulder Domke bag. And at the time I also carried all the gear I owned to every job. So it was simple, when I obtained more gear, I purchased a larger bag, the Domke Little Bit Bigger Bag to be specific. So in my case, like many photographers, all the years of carrying gear over my right shoulder has led to shoulder pain. Nothing severe, just enough to be noticeable. So over time I've come up with a few techniques and tips to avoid this pain and hopefully if you're just starting out, allow you to avoid it in the future. And it all starts by getting that gear off of your shoulder. Below I offer five tips. 1. Use a roller bag like the Think Tank Airport series or roller case such as the Pelican Case to get your gear to and from the assignment. It allows you carry maximum gear without putting any strain on your body. 2. Tip one gets the gear to the location, but then what? I'm a fan of the Think Tank Modular system which allows you to then use accessory packs to carry and organize your gear once there. 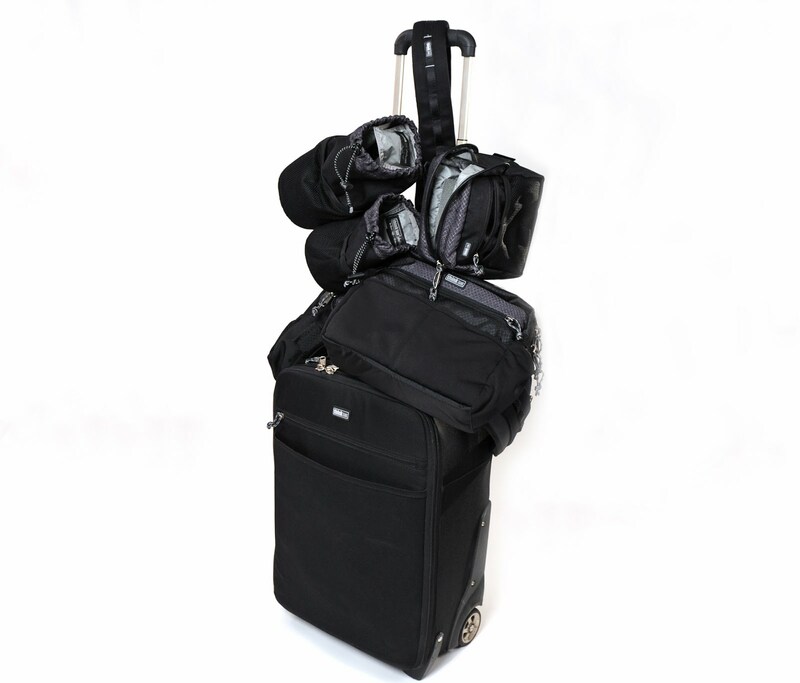 You can load up that large roller bag or Pelican Case, then easily customize later. The belt and pouch system distributes the weight evenly on your hips and if you add a harness, you won't even notice that you are carrying camera equipment. 3. Change your traditional camera straps to something like the BlackRapid line of products. These across the chest camera slings do not put as much pressure on a given shoulder. Plus they have the added benefit of not allowing the camera to slip off your shoulder. Once you get use to it you almost forget about the camera hanging at your side. 4. Match gear to the assignment given. In previous blog posts I've talked about traveling light, with minimum gear. It is a hard habit to break and you will spend lots of time second guessing yourself, but if you really take a look at what gets used and what never leaves your pack, you can start to hone your packing. 5. I suppose I would be remiss if I didn't mention diet and exercise to strengthen your shoulder or back. We all know what is right, but let's face it, even if I was practicing good healthy practices 30 years ago, I'm pretty sure I'd still have some of the same issues as I close in on 50. Just be practical and remember that the body does start to wear out, so why speed the process by lugging too much when you're young. So slow down, pack right, really think through what gear you bring and be sure to take care of your body. And get out there and shoot.